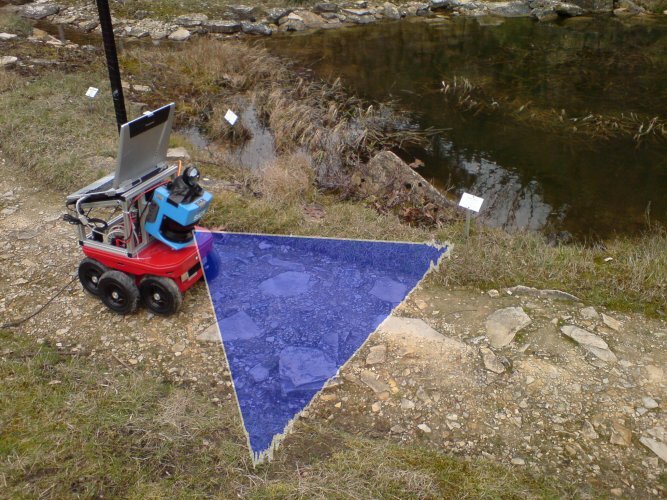 A major challenge in outdoor mobile robotics is the classification of navigable and non-navigable terrain. The variability of the environment, which is caused by different types of trail surfaces, fuzzy road boundaries, and many distinct illumination conditions, pose great difficulties for reliable sensor data interpretation. In addition, autonomous robot navigation at higher velocities requires data interpretation to happen close to or at real-time. Trail following at walking pace and avoiding of hazardous situations in real-time is achieved through statistical analysis of single 2D laser scans and image processing. Laser data is being processed at full scan rate of 72 Hz, images are processed at 13 Hz. The test platform is a KURT2 robot. 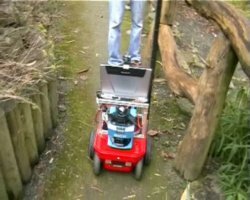 System performance is tested on courses within the Botanical Garden of the University of Osnabrück. 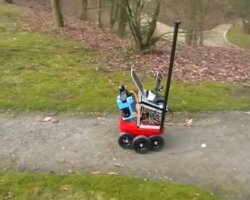 The robot is able to navigate from a starting point to a goal position past defined GPS coordinates while remaining on the trail. In the following section some sample videos showing some typical situations in outdoor environments are provided. The videos can be obtained by clicking on the preview images. All videos are in DivX 6 format. Check out the paper (accepted for Robotics and Application 2007) for more information about the system.